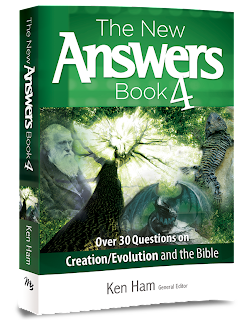 I've been reading The New Answers Book 4, edited by Ken Ham here recently. This book is published by Master Books, a division of New Leaf Publishing Group. At one point, I had read the first book in this series. That was a lot of years ago. I have a hard time with some of these compilation resources. Some aren't well edited, so you end up reading basically the same thing in chapter after chapter, just written by a different person each time. Some don't hold together well. Some are just covering the same information every other creation resource has covered. While I did notice a bit of repetition on points, it was only a bit. And the chapters were clearly written by different people, but the switch from one chapter to the next was never jarring. Most importantly, though, this wasn't just another rehash of the same old information that everyone talks about. I found myself laughing out loud at statements like this one from Roger Patterson in chapter 8, discussing the myth that religion is biased, but science is neutral. Everyone is biased. "The question becomes, which bias is the best bias to be biased by?" Or I hit chapter 9, where the topic has to do with what church leaders have said about the Creation story over the millennia, and I find all kinds of information I haven't encountered before. Chapter 19, about the materials used in Noah's ark gave all sorts of detail about construction -- and specifically WOOD construction -- that I've never seen. Connor has been wanting to read the New Answers Book series, but worried a lot about whether he'd find new information that would make it worth the time. I'm most certainly handing him Book 4, and he can decide if he wants the earlier ones too. Be sure to read other reviews at the Master Books blog.